Happy last Sunday in February, everyone! Sorry this edition of the Sunday Supper Series is going up late. I had assumed I had my post scheduled since I made the recipe a week ago, but in the last days of studying for the bar exam, I apparently forgot to post it. Before you ask, the bar exam was fine. I better not have failed given the low score required and high passing rate, but there's no sense in being confident about something that is beyond my control. I'll receive the results in a few months. Anyway, on to the recipe. I found this recipe on the blog Finding Joy in My Kitchen. The only change I made was to add a whole onion, rather than using a 1 Tbs of dried as she suggested. My husband really liked it as did I, although I wanted a little more heat (this was definitely a sweet dish). For next time, I will stir a bit of crushed red pepper flakes into the meat mixture when I add in the broccoli. One note about the beef--I used chuck roast because I had some in the freezer. It was super tasty, but fell apart completely after 8 hours. 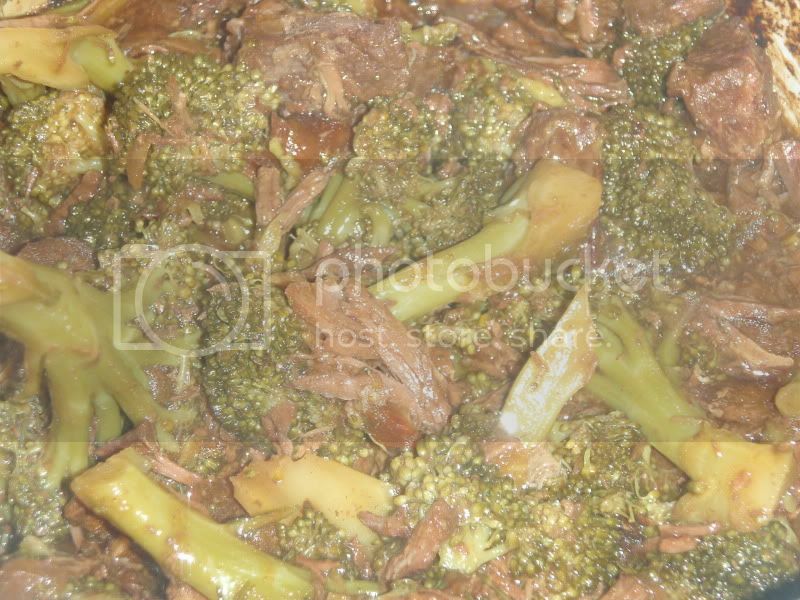 That was fine with me, but if you prefer chunks of meat in your beef broccoli, cut the meat into larger than 1" cubes or use a more tender cut of meat and shorten the cooking time to 6-8 hours instead of 8-10. On the whole, I will definitely be making this again. Whisk beef broth, soy sauce, brown sugar, and garlic together. 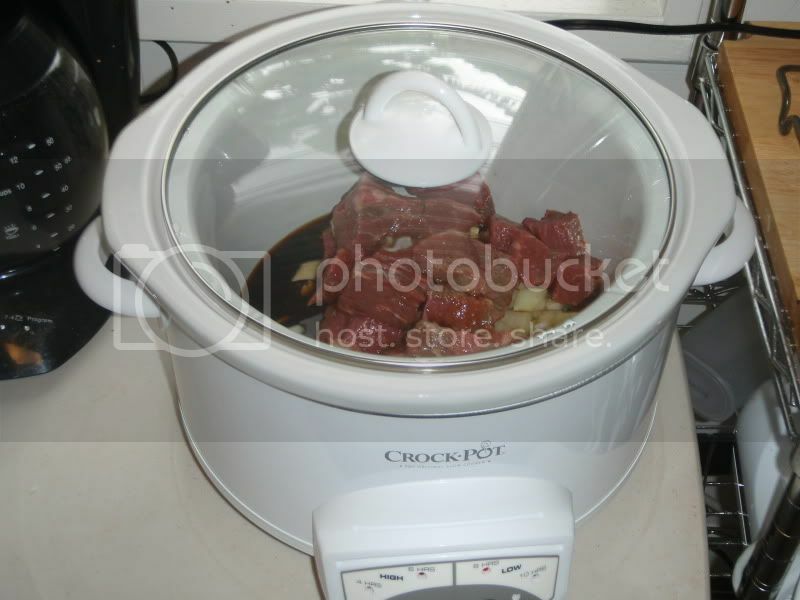 Pour over beef and onions. Give everything a stir. Cook on low for 8-10 hours. In the last hour, mix together corn starch and water. Add the crushed red pepper and the corn starch paste into beef mixture. 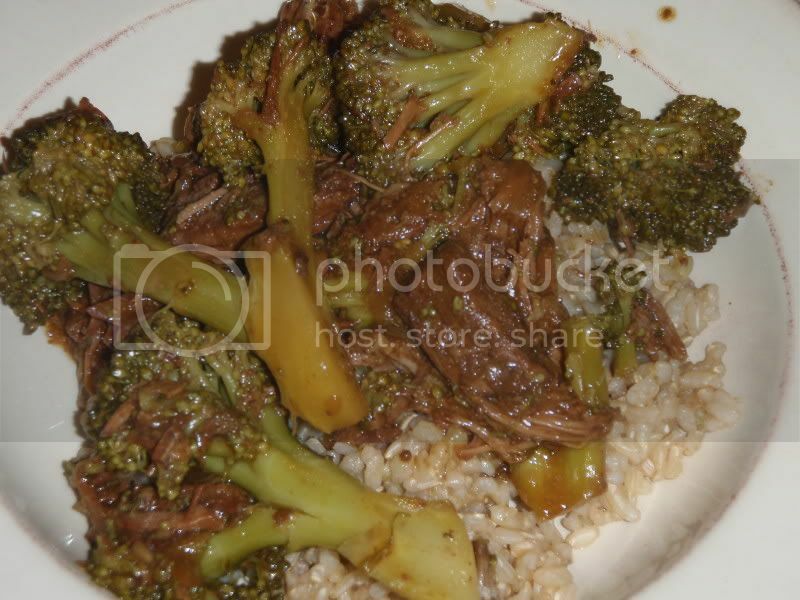 Add broccoli on top (I'd added as much as my crock pot allowed because we love broccoli) and continue cooking for the last hour or until broccoli is tender.